Announcing the birth of a new baby is so exciting. You get to show the world how excited you are to welcome your sweet new bundle into your family. Your adoption deserves the same amount of joy and swelling pride as the birth of any biological child. You’re welcoming a new addition into your family, and whether it be an infant, a toddler, or an older child, your friends and family deserve to celebrate with you. If you’re still on the fence about announcing your adoption, here are three reasons why you should announce your adoption from the rooftop! 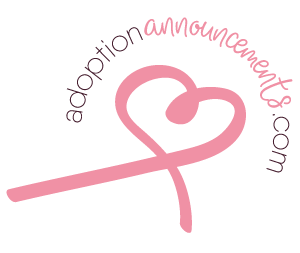 Announcing your adoption is the perfect way to show excitement and pride in your new family. With a new addition, whether that be biological or adoptive, celebrating with your loved ones helps make the experience even more joyful. With this announcement, you get to show your friends and family how much you are fighting for your family, how far you are willing to go to find them (literally! ), and how loved this child is already even though you haven’t met him or her yet. Adoption announcements can give parents that extra boost of motivation to continue pushing through those stacks of paperwork. Whether you announce your adoption before you are matched or after, this is a perfect way to gain support. Adoption takes a village, and this is the perfect time to show others that you need prayer, encouragement, fundraising help, and lots of patience. With your announcement can come an announcement of your first fundraising pitch, or a thankful exposé to those who have already financially supported your journey. Announcing your adoption is the perfect time to show your thankfulness to those who have and will lift you and your family up when you need it the most. Your adoption announcement is also a great time to spread adoption awareness. Many people in your inner circle may not know about the orphan crisis here in our country and around the world. With adoption, announcing helps open up the door for family and friends to ask the burning questions of their hearts. It helps to alleviate the nervousness that can sometimes surround new adoptive parents when they tell their family about their life-changing decision, and it can give your loved ones a way to get involved in helping orphans. We are all called to love and help the fatherless, but we are not all called to adopt. So, when you announce your adoption, it can give others the avenue their heart has been searching for to involve themselves in the orphan crisis of the world. So, go and announce your adoption. Announce it with pride and watch how your loving, supportive village will circle you and lift you up when you need it. And you never know, your adoption announcement may spur another family to pursue an adoption journey of their own.